This article first appeared on my personal blog, Nigel G. Mitchell, Author, Blogger, Geek. Tibor Tarent, a freelance photographer, is recalled to Britain from Anatolia where his wife Melanie has been killed by insurgent militia. The Islamic Republic of Great Britain is a nation living in the aftermath of a bizarre and terrifying terrorist atrocity - hundreds of thousands were wiped out when a vast triangle of west London was instantly annihilated. The authorities think the terrorist attack and the death of Tarent's wife are somehow connected. A century earlier, a stage magician is sent to the Western Front on a secret mission to render British reconnaissance aircraft invisible to the enemy. On his journey to the trenches he meets the visionary who believes that this will be the war to end all wars. In 1943, a woman pilot from Poland tells a young RAF technician of her escape from the Nazis, and her desperate need to return home. In the present day, a theoretical physicist stands in his English garden and creates the first adjacency. 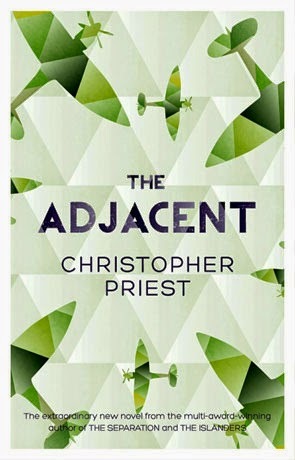 THE ADJACENT is a novel where nothing is quite as it seems. Where fiction and history intersect, where every version of reality is suspect, where truth and falsehood lie closely adjacent to one another. It shows why Christopher Priest is one of our greatest writers. Q: What was the inspiration for The Adjacent? A: The impulse to write The Adjacent developed while I was writing the previous novel, The Islanders. In my mind, the two books are adjacent to each other because I started them in parallel, writing one during the days and the other in the evenings. I found this a stimulating way to write, but after a few weeks I decided to put The Adjacent aside and concentrate solely on The Islanders. As soon as that was complete, I returned to The Adjacent. They are independent of each other, in the sense that either of them can be read without knowledge of the other, but creatively they emerged from the same source. The Islanders began with the wish to make the Dream Archipelago into a rational place: somewhere you could visit or travel through, encountering surprises all the way. As soon as the characters started emerging, the ideas really kicked in. The Adjacent developed from the idea of adjacency: people or times or objects or forces which are next to each other, contiguous, touching but not in communication. Because of my interest in stage magic I knew that illusionists often use a kind of adjacency when performing: they set up something that momentarily distracts the audience (something funny, or seemingly accidental, or surprising), which gives them a moment of invisibility. And I was interested in camouflage: invisibility in plain sight. These both struck me as having possibilities for the basis of a story. Q: In The Adjacent, you deal with multiple characters, multiple timelines, and multiple locations. How did you keep track of them all as you wrote the novel? A: I’m just interested in this sort of thing. I think in a complicated way. Can be frustrating when I’m trying to make a decision, or following an argument, or describing something simple, but it’s a bit of a godsend when I’m writing fiction. Q: In The Adjacent, you return to a place you've visited in several of your novels, the Dream Archipelago. Can you talk about the Dream Archipelago and why it resonates with you and your readers? A: It began as an intriguing and slightly exotic background for some stories. A sort of backcloth, which I could adapt and modify as I needed it. But as more stories followed I became interested in it as a literary format. It is never “real”, it never has a rationale. But by thinking of it in detail and describing it in detail it gains the quality of real-seeming. Most fiction is real-seeming. So I have gone on developing the Dream Archipelago as a kind of shadow reality where fiction takes place. My novel The Affirmation (1981) was my first attempt to explain this process. The novel is still there for anyone to find. I thought that was the end of it, and for a few years put the Dream Archipelago aside. Then I started getting interested again, and in recent years I have been finding it an increasingly fruitful source. It’s not the only thing I’m interested in, but it now lies adjacent to other work. This is partly why a Dream Archipelago sequence suddenly appears in The Adjacent, an otherwise realist novel. Another attempt to explain, if you like. Q: Many of your reviewers have described The Adjacent as one that challenges the reader. As the author, is that your goal or a by-product of the story you wanted to tell? A: I believe my books are easy to read. They are certainly written with that intention. They all have plain narrative, believable characters and situations that are not beyond the bounds of possibility. All my novels have plots, and story surprises, and conclusions. I am always therefore puzzled when someone says a book of mine is “challenging”. As this has been said for several years I've had to try to work out what is meant by it. I see “challenging” as being reviewer-shorthand for “a bit difficult to understand”, or “not completely explained”, or even an attempt by the reviewer to warn a potential reader that the book is “hard to read”. This is to my mind simply not the case, so what is going on? I maintain that reading is as creative an act as writing. When you read a book, two things happen simultaneously. You read the physical words, and you reproduce them in your mind’s eye as images, created by the words. Every reader is familiar with this process. At the end of the book, when you put it aside, it is of course impossible to remember every word in it. No one commits a whole book to memory! So what we take away from the reading experience must be our recollection of the mental images the book has created. Whatever these images are will be unique to every reader (which is why I say it is a creative act). But the stories of my novels frequently mislead the reader. The images they create are clear and understandable, but that’s just a first step. Later on information emerges that perhaps the assumption we make from the words was not complete, or was incorrect in some way, or at least was seen by someone else as having a different meaning. The reader’s mental image has to change or adapt. Now, most readers find this a completely natural and enjoyable process, adding to the pleasure of reading. But some reviewers (who of course always read books quickly) obviously find this a bit annoying, feel they might have missed the point, don’t have the time to go back and discover what really happened, and feel they have to warn readers that they will be “challenged” by the book. I believe most readers are more attentive that that, and don’t have any trouble with fiction that is more than just a simplistic narrative. So when you hear the word “challenging” about a novel, anyone’s novel, go for it! Don't be dictated to by reviewers. Thanks for your insightful and detailed answers! Be sure to check out Priest's The Adjacent. I'll have a review of it soon. To hear about my new releases first and get free stories and other goodies, sign up here. Your email will never be shared, and you'll only receive messages about new releases and free stuff. What did you think of the interview? Have you read any of Priest's work? I like challenging books. I haven't read any of his books, but this has made me curious about them. Do we finally have a Black Panther movie? !